Lee Fergusson is very good at running multimillion-dollar companies — when he’s not founding universities in locales like Cambodia and Australia, authoring studies used by governments to establish environmental policy, or leading large-scale environmental clean-up projects. A graduate of MUM in 1991, Lee began his career in higher education, shifted gears into telecommunications, and eventually found his passion working in environmental remediation. Environmental remediation focuses on the removal of contaminants and pollution from soil, ground water, surface water, and sediment to protect human health and the environment. As Chief Executive Officer of Virotec International Ltd, Lee manages company operations and oversees remediation projects. Virotec has offices in Australia, the U.S. and the U.K. He’s also CEO of Greenhouse Australia, which provides consulting services to the coal seam gas industry. Lee’s early career was spent in higher education. Among his achievements, he worked with the Royal Government of Cambodia to establish a new university in Preah Veng province which has graduated more than 2,000 students in business, management and agriculture. He established a similar college in Melbourne, Australia, offering a curriculum fully accredited by the State Government of Victoria. A thought leader frequently at the forefront of his field, Lee has been a featured speaker at environmental conferences in Hong Kong, London, Cannes, Barcelona, Colorado Springs, New Orleans, and Washington, D.C. His articles and research papers on mining, sustainability, and environmental waste have been published in more than 15 professional journals. His work aided the Australian government in joining the Asia-Pacific Partnership on Clean Development and Climate. He has authored two books, ViroMine Technology: A Solution to the World’s Mining Megawaste and Virotec: A Ten-year Story of Success in Environmental Remediation. 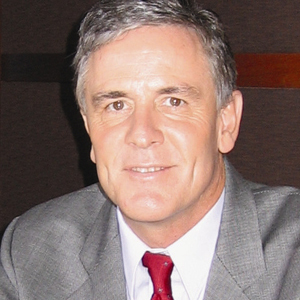 During the telecommunications phase of his career (through 2001), Lee ascended the corporate ranks, serving as president and CEO of USA Global Link, Inc., a $2 billion telecommunications company. Later, he was CEO of Global Online India, Inc., then a $500 million NASDAQ-listed company. Interestingly, prior to receiving his PhD at MUM, Lee earned an undergraduate degree in visual arts, and even, for a time, made his living as an artist. But it wasn’t until he enrolled at MUM as a mid-career professional that he decided on environmentalism. 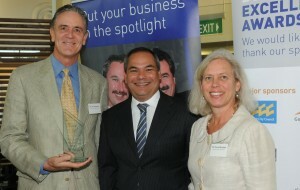 Lee and his wife, MUM alum Anna Bonshek, accepted the 2012 Environmental Management Award (photo above, with Gold Coast Mayor Tom Tate). Lee and Anna live on Australia’s Gold Coast.